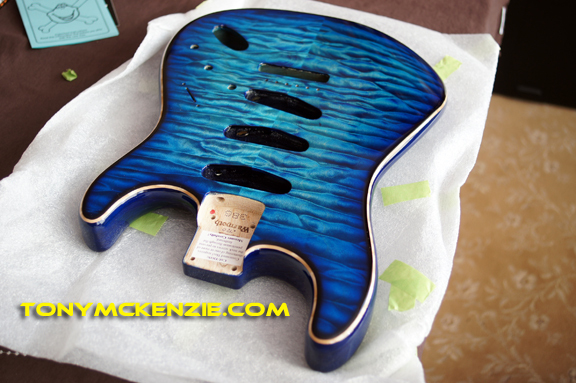 This is a review of another Warmoth Stratocaster licensed replacement body for a Fender guitar in blue burst finish. Is this body REALLY worth it with the high cost? and what about options? Warmoth is a well known Fender authorised manufacturer of custom and not so custom bodies for many guitars. I had gained much experience from Warmoth over the years and have bought at least four previous bodies for Fender Stratocaster's that I have made. Even the 'orange flamed' stratocaster you see in my pictures has a Warmoth body. So I felt that Warmoth could be trusted to make a body like no other - in fact the best Fender Stratocaster body in the world. Price would not be important - but the body would. So I set out to buy the body from them. Warmoth have two ways of buying bodies from them - either premade 'off the shelf' bodies, or completely custom - with a massive hike in price for the privilege of having them make it. I chose the custom choice because I wanted what was never off the shelf - I looked for months. So I expected to get a body to my EXACT specifications - and costing over £700.00 (that's US$1200.00) I really should get what I order, but more of that later. 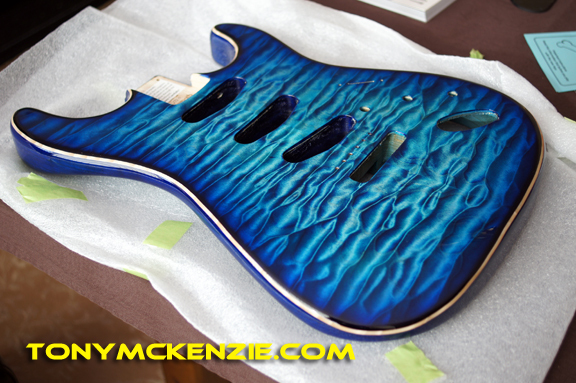 A Blue burst finish with 'PRS' style masking off. Light Swamp ash: They got this spot on - eventually making a body (non hollowed) of just 3.1 Lbs. in weight. Quilted Maple Top: They got this right - they could not really get it wrong. I personally chose this top wood from about nine or ten 'top woods' in the quilted maple section of the custom build area of their web. It increased the body cost dramatically - but I'm pleased to say (and I hope you agree) that this top really is one of the best in the world you have ever seen... check those images at the top of this page. 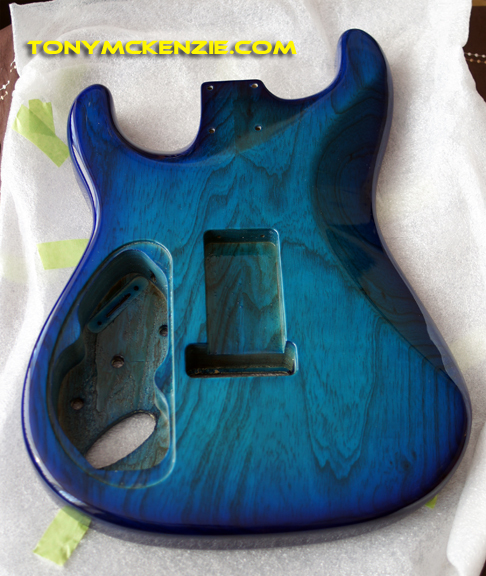 Rear Routing of the Body: Warmoth got this exactly right - and the controls eventually fitted perfectly. You will notice (if you watch my video build on this guitar) that I had to 'file out' the pot holes (no, not those on the highway) to make the pots fit. Pots were genuine Fender - so should have fitted, but Warmoth left the over spray in the holes making them unable to take the pot. That's nothing new really so get your file out - but be careful! The .720 Modification: This modification is usually used if you have a rear routed control compartment. The reason is, that if you do not do this, then the neck sits a little higher in the body (to facilitate the scratch plate). Of course, with a rear routed body there is no pick guard so you can 'afford' to drop the neck by .720. This makes the neck sit right in this body. and Warmoth got this one right too. And so they should. Jeff Beck Neck Joint: Ouch. When I got this body back this is the first thing I noticed. Warmoth did not do as they were told... no matter how much money you throw at something and trust someone to do things that you want they just don't do it. This mistake caused my Fender 50th gold neck plate to be relegated to the dustbin (nice - bearing in mind the seller wanted US$200). This caused me to reconsider the neck plate. I used a chrome one in the build but later replaced that one with the one in the picture below. Bang.... I just shot the Warmoth rep. Here's the image of the neck plate mounting I wanted (this is the image I sent to Warmoth and on the right is what I got... as you can see, the angled bit is basically correct but the contour (the rounded bit) and the drilling is simply wrong. Why Warmoth did not bother is beyond me - because they confirmed it all by email. Not rocket science but when you pay this sort of money it takes the mickey... and I don't mean mouse. Rear Dual Battery Compartment: Ouch again. They got this wrong too. There was none! And now its really too late to get it done. This did not cause me problems today... it might in the future. The neck problem on the other hand was a real pain. 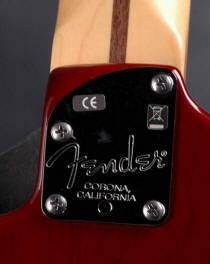 Fender Body Shaping: Warmoth got this right. I would have been really concerned if an 'Authorised' manufacturer could not get the Fender body shaping correct... you might be too? 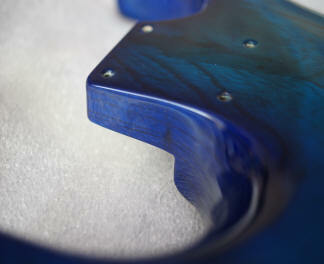 Blue burst Finish with Natural Masking: Warmoth did a superb job of this finish. One reason why I had to wait nearly two months for the body! Overall Body Weight: The final body weight without any chambering (I really wanted a solid body like the original Fender Stratocaster) was 3.1 Lbs.... is that a record? Maybe not - but it's as light and resonant as any body it is likely you will ever see - oh and get one from fender? I think not. Well that has been a review all in itself - let alone a whole guitar review. The body was perfect - except for where they got it wrong. It caused me much pain especially in the neck mounting area and being unable to use the neck plate that I wanted to fit (it was a fantastic neck plate and would have rounded this guitar off perfectly). In some ways it was disappointing to me - and it would have been to you too - if your specification was not met at this price. In any case, I eventually got nowhere with Warmoth so I just carried on with this body. It's a pity they got it wrong - its the first time I have had issues with them - but unfortunately it was on the most expensive body I ever bought from them too. Rating for this is 6 out of 10 - so there. 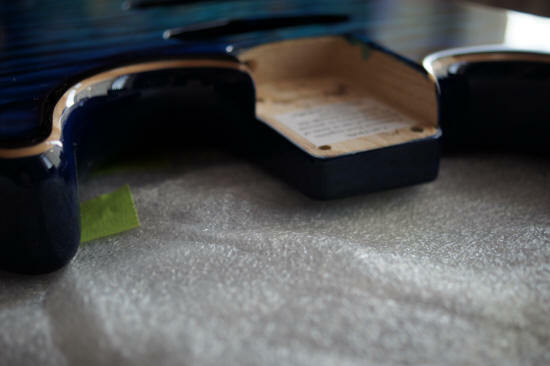 If you think that buying a Mex body or even some other cheap body will do for your guitar what this one has achieved for the 'Blue' Fender then you would be absolutely wrong. While the body eventually was slightly different than what I asked for, the result was still a fantastic sustaining guitar (down to a number of things but the body was a major contributor) which remained light, and looks and sounds better than all the Fenders I've ever seen or played - maybe with the exception of 'Brown' which I also built with those David White pickups (they are awesome). Was it worth the money? As one guy recently in a guitar shop pointed out ' You CANNOT buy a guitar like that from Fender - and if you could it would cost you the earth'. He was right too! The truth is - that Warmoth did do a great job, the body was wrapped well and its difficult to fault what arrived except for the missed bits. Checkout the review of my other recent review of a Warmoth Stratocaster body where we discuss other aspects of Warmoth bodies.